The Texas economy grew tepidly in May. 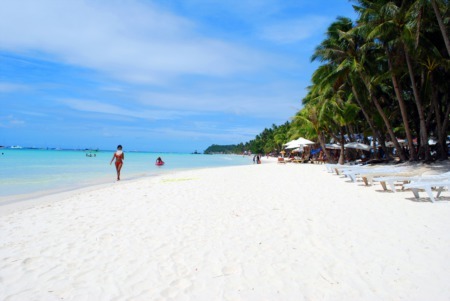 The number of jobs in the state increased only slightly for the month. Annual employment grew primarily due to the services sector, trade, and leisure and hospitality. Manufacturingand mining and loggingemployment in Texas declined while servicescontinued a positive trend. Texas housingdemand improved moderately with Houston appearing to have leveled. Dallas-Fort Worth housing sales have started to show some signs of weakening. State building permits improved year-over-year but slowed month-to-month. Texas Real GDPfor fourth quarter 2015 registered a 1.8 percent annual growth rate, a slower rate than the nation’s. This is another indicator the Texas economy is slowing. The Dallas Fed’s Texas Leading Index, which signals future directional changes in the business cycle, declined slightly in May. The index was negatively affected by declines in the help-wanted index and stock prices of Texas-based companies. The index was positively affected by increases in the Texas value of the dollar, U.S. leading index, oil prices, average weekly hours worked, and a dip in new unemployment claims. 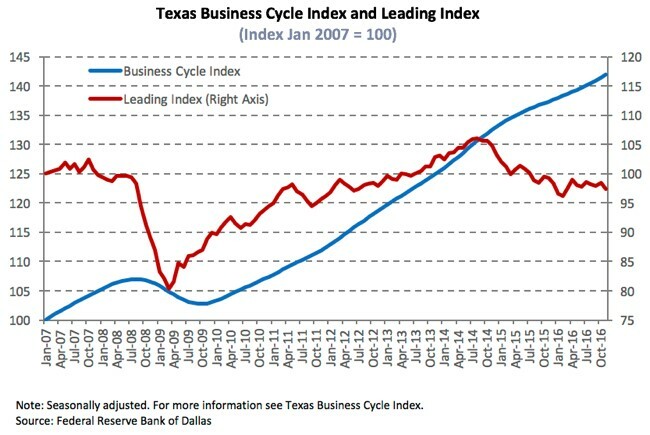 The Texas Business Cycle Indexthat measures current economic activity continued its positive trend. 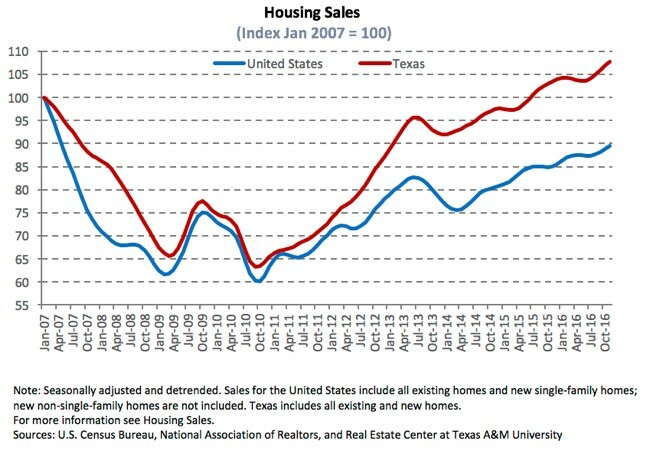 Texas housing demandcontinued its long-term positive trend. In May, statewide housing salesincreased 5.3 percent year-over-year on a seasonally adjusted basis (positive 6.4 percent not seasonally adjusted). Austin, Dallas-Fort Worth, and San Antonio continued to register year-over-year increases in sales. Houston posted a 1.1 percent year-over-year seasonally adjusted rate (positive 8.2 percent not seasonally adjusted) after a long period of weakening due to the impact of the energy sector decline. Overall, Texas housing sales continued to increase year-over-year but slowed on a month-to-month basis. On the supply side, the number of building permitsissued increased moderately in Texas although below the rate of growth for the U.S. 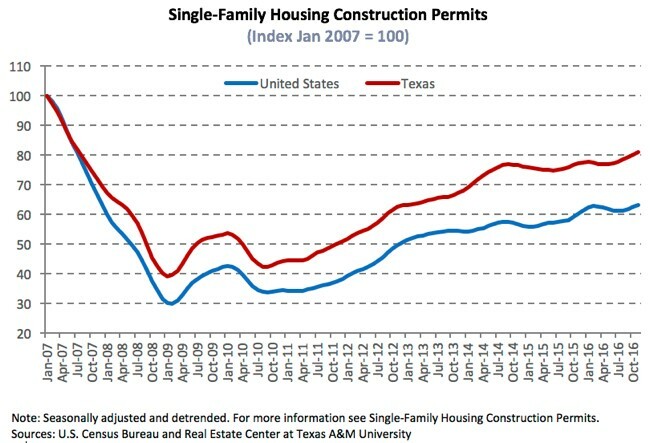 In recent months, Texas’ building permits have declined on a monthly basis. Austin has registered an overall increasing trend in permitting since July 2015. Dallas-Fort Worth monthly building permits continued to slow after reaching a peak in December 2015. Houston and San Antonio posted positive year-over-year values after a period of month-to-month decline primarily due to lack of developed lots for housing construction. Houston and Dallas-Fort Worth led the nation in the number of single-family permits issued followed by Atlanta, Phoenix, Orlando, and Austin. 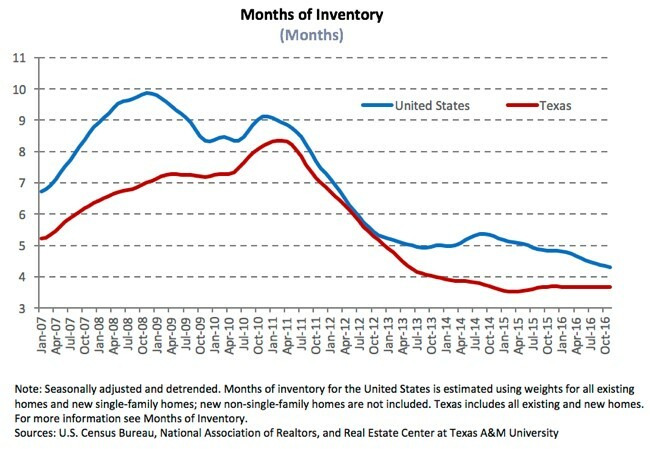 Months of Inventoryof Texas houses for sale remained low at near 3.6 months compared with 5.6 for the nation, seasonally adjusted (around 6.5 months of inventory is considered a balanced housing market). Overall, supply has been restricted due to limited lot inventory and construction labor shortages. Rising Texas home prices reflect the low inventories resulting from constrained supply and steadily increasing demand. Since 2011, Texas home prices have increased more rapidly than the rate of increase for the U.S. In 1Q2016, the U.S. and Texas FHFA Purchase-Only Housing Price Indexesincreased from the year prior by 5.7 percent and 7.1 percent, respectively. West Texas Intermediate crude oil prices averaged $46.84 per barrel in May compared with $59.28 a year earlier. Oil prices have increased since February 2016 as a result of the markets’ perception that global inventory build-ups are slowing. The decrease in the number of operating rigsin Texas continued in May, while oil production declined only slightly in April and continued to exhibit a negative trend. Texas employmentcontinued to register a positive annual growth rate at 1.5 percent seasonally adjusted, albeit gaining only 200 jobs. After the employment growth rates in the United States and Texas converged in 3Q2015, Texas continued below the year-over-year employment growth rate (seasonally adjusted) for the U.S.
Much of the annual employment growth occurred in the services sectors, primarily financial services, education and health services, professional and business services, as well in trade and leisure and hospitality. This last two service sectors registered negative month-to-month growth. According to the Dallas Fed’s Texas Retail Sector Survey, retailer’s perceptions of economic conditions in the retail sector declined after showing positive sentiment the month prior. The continued expansion in the services sectors follows the expectations presented by the Dallas Fed’s Texas Service Outlook Survey. 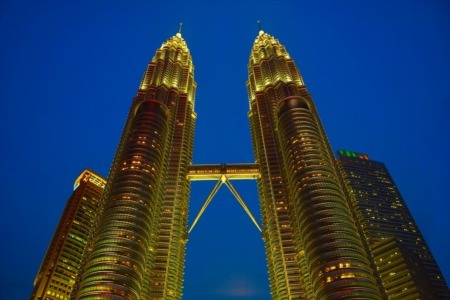 The major monthly losses in employment occurred in construction, manufacturing, and mining and logging. Construction employment grew by 1.1 percent year-over-year seasonally adjusted but lost 3,000 jobs. Manufacturing employment continued a decline that started in April 2015 with a negative 4.4 percent year-over-year change and a further monthly job loss during May. Concurrent with manufacturing employment contracting, the Dallas Fed’s Manufacturing Outlook Survey declined sharply in May suggesting that the manufacturing sector contracted. Houston, as expected, registered a more drastic slowdown in overall employment versus the other major metros in the state. Surprisingly, even in the presence of dramatically lower oil prices and drilling activity, total jobs in Houston were 0.3 percent greater than May 2015, although losing 5,400 jobs (seasonally adjusted) from the prior month. Job growth in Texas helped to keep the unemploymentratebelow the national average. Texas’ seasonally adjusted unemployment rate equaled to 4.4 percent compared with 4.7 percent for the United States. Labor force participationreversed its trend over the past couple of years from workers opting out of the job market to instead joining the labor force. 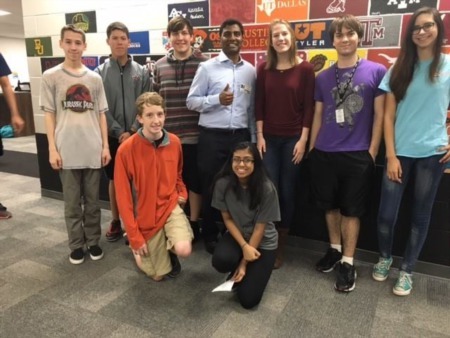 In the past few months, participation has increased in Texas and across the U.S.
Real total private employee hourly earningsfell 0.7 percent year-over-year, registering a lower growth rate than the nation since August 2015. Real earnings in Texas have not consistently remained above January 2007 levels on a seasonally adjusted basis. Real earnings for Austin and Houston have increased above January 2007 levels while Dallas, Fort Worth, and San Antonio have not. Increases in the Consumer Price Indexhave been suppressed and remain low in the U.S. as a consequence of low oil prices and a strong dollar that has made imports cheaper. The Consumer Price Index for Dallas continued to post a positive value of 1.0 percent year-over-year after registering negative rates in the majority of 2015. The Consumer Price Index for Houston year-over-year change was 1.4 percent in April. Because of weakening global demand, lower oil prices, and a stronger dollar, U.S. and Texasexports of all commodities and manufactured goodsfell in May year-over-year. Both the U.S. and Texas traded value of the U.S. dollar slightly appreciated after decreasing in prior months. The dollar value reflects the appreciation of the U.S. dollar with respect to world currencies, making U.S. and Texas exports more expensive to foreign buyers. Note: Recent changes in the Real Estate Center’s data reporting have included shifting from reporting on Multiple Listing Service (MLS) areas to a Metropolitan Statistical Area (MSA). In this report, the respective charts reflecting these changes include Months of Inventory and Housing Sales.